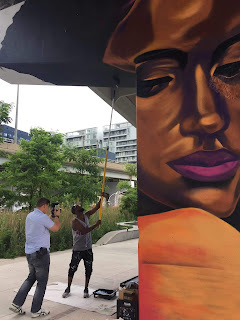 I recently painted a pillar in Toronto's Underpass Park along the PanAm Path. This project, entitled Multipli’city, is managed by Mural Routes and is part of the StreetARToronto Partnership Program in collaboration with the Corktown Residents and Business Association, the City of Toronto Parks Department, and Relay 2017 – Friends of the PanAm Path. 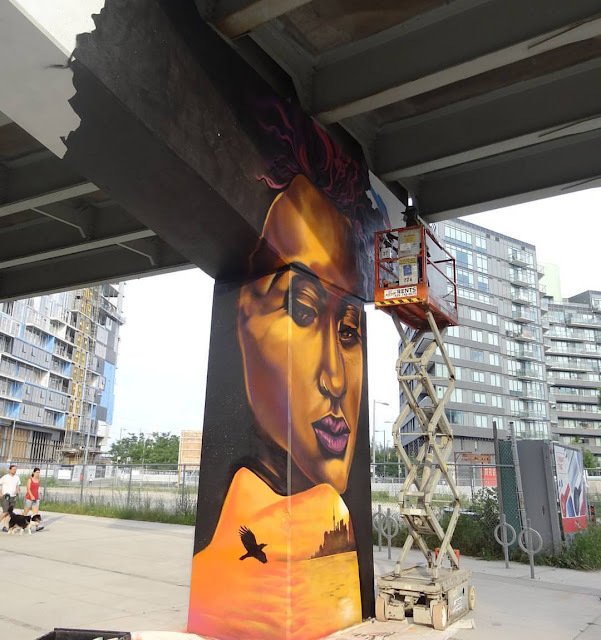 While the artists’ designs are diverse, they are tied together by the theme of multiplicity, a theme intended to remind us that our diverse people are the real pillars of Canada. I used my pillar to highlight the under-representation of black womxn in mural art as both subjects and artists. My intention was to provide visibility and positive representation in the hopes it may inspire others. 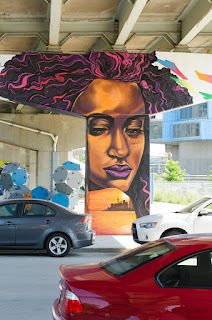 My figure holds the "City on Her Back", a nod to the ways in which I've seen many black womxn in my life face and bear the challenges of urban living, often disproportionately and without recognition while remaining resilient, graceful and strong. They are the pillars holding up our communities and to them I give thanks!